Eddy current testing is particularly well suited for detecting surface cracks but can also be used to make electrical conductivity and coating thickness measurements. Here a small surface probe is scanned over the part surface in an attempt to detect a crack. Backed by our skilled professionals, we are involved in providing Eddy Current Testing Machine Service. 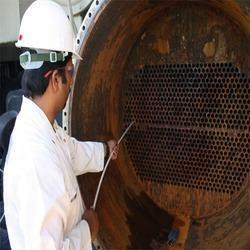 We are remarkable entity, engaged in offering superior quality Eddy Current Inspection Services. To meet the modern market demands, we are dedicatedly engaged in offering a wide assortment of AC DC Current Calibration Services to our valuable clients. Appreciated for quality, these services are highly demanded by our clients. Moreover, clients can avail these services as per their needs at highly competitive prices.